Not too long ago Pam over at Retro Renovation gave plenty of reasons to own a mid-century home. They are all very true and very good reasons to live in a mid-century neighborhood. All of them apply to my own experience, but there was one reason that I bought a mid-century house wasn’t included in the list: With a mid-century home you always know what’s in fashion. Whenever you self select into an era, fashion or design that has passed, you self select out of everything else. Which, for me, makes everything much easier. There are no new options coming out (unless you go truly mid-century modern) and there's plenty of reference material to research what things should look like in a mid-century home. It lets me have a cohesive look with much less effort. 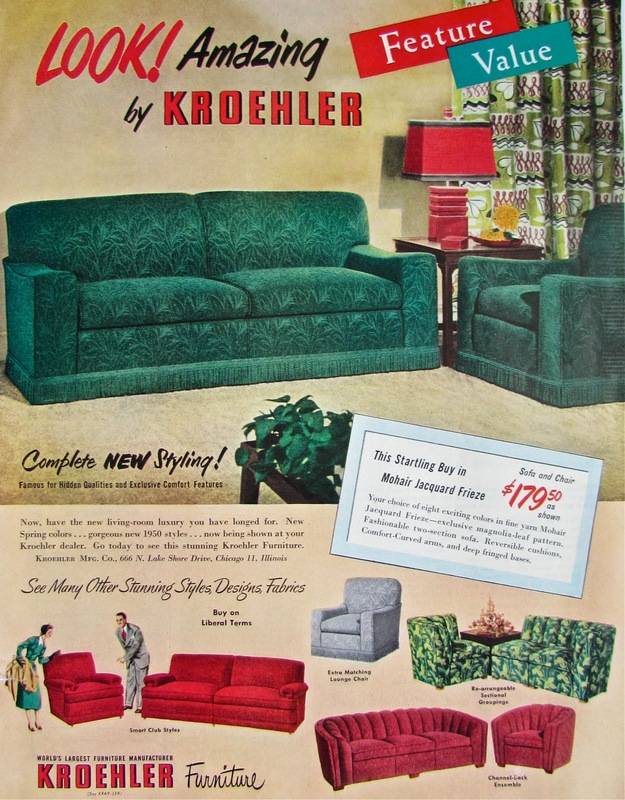 For example, if I want to buy a new sofa, my options instantly shrink from millions of potential sofas to thousands of sofas that were made in the 1950s or look like they were made in the 1950s. For me, that’s a good thing. It’s a real paradox of choice situation. Having a mid-century home lets me focus and find the sofa (or whatever) that’s perfect for both me and the look of house. Sure, sometimes that means not being able to buy the exact option you want, either because it’s no longer manufactured or because its so rare that it’s out of your price range. But you can usually find a decent substitute or reproduction, or if you’re really patient, wait till you find it at the right price. Of course, this reason is based on the assumption that you want the interior of your home to be appropriate to the house itself, but I think for a lot of people, that’s the case. AGREED! It just took me awhile to realize what we live in (seriously). Now I always think... is it really appropriate? And that simple question makes shopping (and life) so much easier. Having a time-period house with period-appropriate items honestly improves other parts of my life by not having to fret over the details. And it looks fantastic to boot. Interesting observation. Before I moved into my current home, I decorated very traditionally, and about every two years, I'd redecorate down to dishes and towels in order to be up with the most current colors and styles. Once I switched to mid-century decor, I haven't changed furniture or my color scheme. I'm having exactly the same experience. It used to be, "These plate will do because I'll only have them for a few years anyways." But now it's, "Well, these plates are going to be my plates for the rest of my life so I'd better really like them." And it's mainly because I selected out of the "this is the hot color for this summer" mentality by selecting into a style I love and can follow forever.